SIBERIA, INCLUDING the Russian Far East, covers 4.9 million square mi (12.8 million square km), an area that is three-fourths of the Russian Federation or onethird larger than the UNITED STATES and one-fourth larger than CANADA. 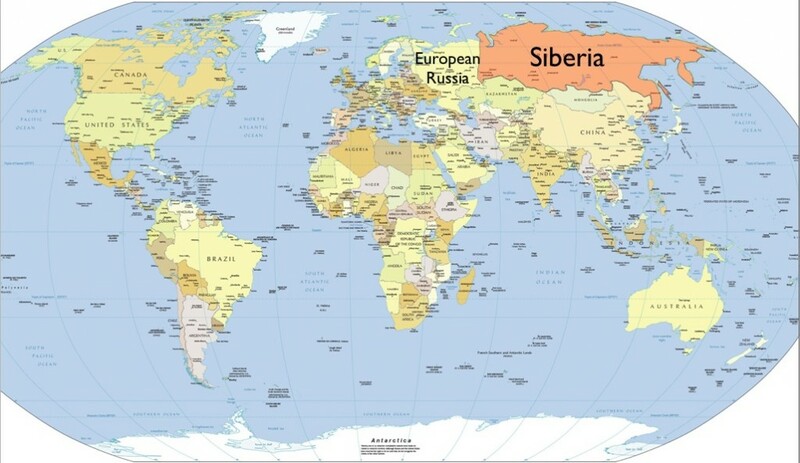 Siberia stretches from the URALS in the west over 3,000 mi (5,000 km) to the PACIFIC OCEAN in the east. It has borders with KAZAKHSTAN, MONGOLIA, and CHINA. In the very unlikely case that Siberia would separate from the Russian Federation, it would become a large state by its territorial size, but with a sparse population. Siberia’s size is not advantageous as the climate is usually very harsh with a marked continental climate. The northeastern part shows the coldest temperatures in the Northern Hemisphere with — 90 degrees F (-68 degrees C) at Oymyakon and Verkhoyansk in Yakutia. In summer, temperatures can reach 90 degrees F (32 degrees C). These great differences in temperature present a challenge for human colonization and exploitation of the rich natural resources (wood, coal, oil, gas, gold). Permafrost has a decisive impact on soil formation with the consequence that infrastructure is expensive to build. Therefore, the famous Trans-Siberian Railroad, built between 1891 and 1903, touches the southern belt of Siberia. Although Siberia is inhabited by nearly 45 different ethnic groups, Russians represent the majority. According to the census of 1989, 85 percent of the population are Russians. Russian colonization since the late 16th century resulted in a decline of the indigenous nationalities that counted more than 200 tribes before the Russian arrival. There are three great ethnic groups: Finno-Ugrians, Turco-Tatars, and Tungus and Paleo-Asiatics. In the Middle Ages, Siberia was a part of Genghis Khan’s Mongol empire. At that time, the Siberian khanate kept up trade relations with Central Asia and China. The Russian push to the east was motivated by the search for furs and is associated with the legendary Cossack leader Yermak. Historians compare the Russian colonization of Siberia with the opening up of the North American frontier by British, French, and Spanish colonizers. Like in North America, settlers installed fortified settlements (in Russian: ostrogi). The Treaty of Nerchinsk (1689) allowed China to maintain its territorial sovereignty over the Amur region. This, however, changed, in the mid-19th century when East Siberian Governor-General Nikolai Murav’ev-Amurskii annexed the borderland for RUSSIA. In 1860, China had to cede the coastal province (today Primor’ye) where the Russians founded the harbor of Vladivostok. After the peasant liberation in European Russia (in Siberia serfdom did not exist), the “great migration” of nearly 5 million peasants from the UKRAINE and central Russia began. This process was facilitated by the construction of the Trans-Siberian Railroad. Migration, railroad construction, and expansionistic aims in nearby Manchuria moved Russia into conflict with JAPAN. Russia’s “manifest destiny” in the east suffered a heavy defeat in 1905 by Japan, the rising power in the Far East. The late 19th century also saw the awakening of a Siberian regionalism. One of Siberia’s influential intellectuals, N.M. Yadrintsev, argued that Siberia was closer to America and Asia than to the Russian heartland. However, the October Revolution of 1917, the Civil War, and Stalinism strangled all thoughts of Siberian autonomy. In the 1930s and during World War II, Siberia became an important “resource frontier.” After the occupation of the Ukraine by German armies, the Kuznetsk Basin (Kuzbas) was the main coal producer of the Soviet Union. By 1940, before the German attack, Siberia was producing 95 percent of tin, 80 percent of tungsten, and 70 percent of molybdenum used in the Soviet Union. Between July and November 1941, the great evacuation of manpower and factories from European Russia behind the Urals began. Siberian industry produced military equipment like tanks and bombers. However, industrialization of Siberia in the 1930s and 1940s is also connected with the Gulag prison system. Alexander Solzhenitsyn estimated that there were 225 labor camp regions, stretching over the vast lands of Siberia like an archipelago. In this “empire” nearly 40 million persons did work, 4 to 6 million of them in the Kolyma camps of the far northeast. From 1950 until the 1970s, great technical projects like Bratsk dam, the Baikal-Amur magistrale (BAM), and the discovery of the oil and gas fields in western Siberia (Surgut) were realized under the tutelage of Akademgorodok, Siberia’s science city near Novosibirsk. In 1973, during the Arab oil embargo, western Siberia exported via the BAM 70 percent of its oil production to East Asian and Pacific Rim countries. However, these megaprojects meant a deep challenge to the natural environment and eroded traditional life of the Siberian natives.